I'll post a bigger post tomorrow (my time!) buut! We are alive! And Ex isn't abandoned! And oh my gosh, it's Halloween event! Zombies galore! 1) Jylani Amplex (#9064) with 447 snowballs thrown! 2) The Grox (#160) with 301 snowballs thrown! 3) Wulfraptor (#170) with 286 snowballs thrown! 4) tt (#86) with 246 snowballs thrown! 5) Shadowlight (#25257) with 237 snowballs thrown! Hope everyone had a good November (and the Thanksgiving therein, if you're in the US!) cause now it's December! With December comes the annual snowball fight! Collect snow pieces on your farm by being logged in, then chuck them at your friends and enemies in order to get chunks of meat in ice, as well as to compete in the competition! Also, I believe this means that the Advent Calendar is available from the map! Also, this month's item is the Toy Sailboat! Use it to change one unbred lab dino into an adorable synapsid Dimetrodon! This month's update made possibly by The Grox (#160)! You're the hero today! Hi guys and welcome to November! October was pretty exciting, so congrats to the winners of the Club Wars, Zombie Tag, and also to the Scavenger Hunt players! It was pretty exciting for us to run so many things at once! Also, on that note, this month's item is the Rhino Toy! Use this on an un-bred lab dino to transform them into an Albertosaurus! Anyone who buys $20 or more worth of scales gets one of these guys with the purchase. Anyway, on that note, hope everyone had a good Halloween and has a better November! The winning club of Club Wars this year was the Quill club!!!! All users who defeated over 50 enemies and belong to that club received 2 scales - all other clubs with users who defeated more than 50 users received 20 tokens! Wooo! 1) Nyx (#6118) with 112 infections! 2) Jylani Amplex (#9064) with 112 infections! 3) Joseph Lokison (#12329) with 110 infections! 4) Wulfraptor (#170) with 106 infections! 5) Spotty (#785) with 106 infections! 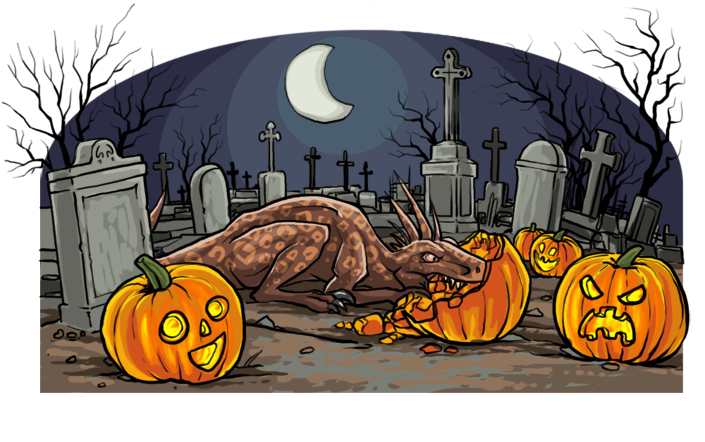 Okay, as some of you might have seen, the pumpkin carving event is live now! Collect and carve pumpkins by browsing the site, then carving them over at the pumpkin patch on the map. Each time you carve a pumpkin you get a chance to get a random one of the possible jack-o-lanterns, so have fun collecting them all for your shelf! Also, we've finally set up the scavenger hunt! (I apologize in advance for my ridiculous writing, I get a little longwinded sometimes). Search for dinos, find the clues, and figure out the code. Feel free to work with a friend if you're having trouble! Good luck to everyone, and happy October! We have a task for you, which you may choose to undertake. Someone's been spreading rumors that the dinos over in Zani's farm are feeling generous this halloween, and might be handing out treats (we hope!) There's far too many to visit all of them though, so let's just do a few, one by one. Who knows, maybe by the end you'll end up with at least one prize! -There's a raptor you've heard good things about. One with a double crested head and an unfortunate name. 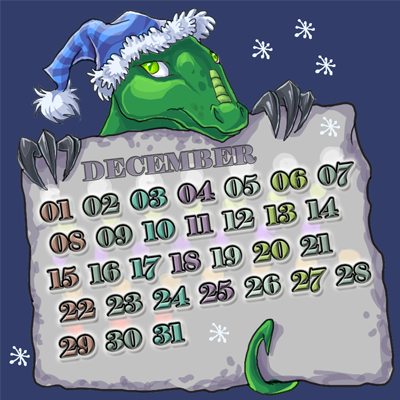 This dino has a dark, night color and dark red eyes, but maybe if you find it it will give you something nice! Okay, just updating you guys on what we've got going for october so far! This month's monthly item has been chosen by the public to be the Terror Egg! Use this on a lab born, unbred dinosaur to transform it into a Terror Bird of the same gender and color! Thanks to RaptorGirl (#31081) for the suggestion, and tt (#86) and Shadowlight (#25257) for the support! Hello everyone and welcome to the spookiest month of the year! Anyway, the donation item for the month will be..... I don't know! first person to replies to this gets to decide :D! You're all the heroes of halloween! Hello again! This is Bob with another late monthly update! I actually am sort of in the process of moving states, which is why I've been off so much lately. Sorry to everyone for my intense derpiness :,D It's also much colder up here by the lakes than in Boston, and I was not entirely prepared! Lessee, monthly item by demand will be the Golden Stork! This helpful guy makes sure your next breeding will give you a full nest of 8 eggs! Really helpful if you're forgetful like me and you've only got one breeding left in a female! Also, special thank you to Condemned (#5662), Tessa (#28211), and Spotty for reminding me about the news. You're all the heroes of the month! Welcome to August! This month is special to us because it has two of our mod's birthdays in it, Sammei's b-day being yesterday, in fact! Zani's birthday is on the 26th too, so wish them both happy birthdays, even if you're a little late or a little early. The Summer Splash event is still on, so keep tossing those balloons so you can trade them for all the neat summer treats! Herbifertile forces a breeding from a herd of adult herbivores immediately, which is a big help if you're like me and you forget to log in during breeding season.